The Standard Live Event Solution is ideal for novice video producers who are looking for affordable and easy to use equipment with exceptional quality. The pan-tilt-zoom cameras in this workflow provide a stepping stone for novice producers to utilize multiple camera angles in a production. 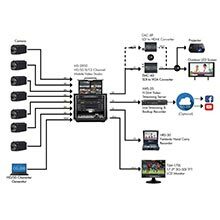 With 8 inputs, supporting up to 7 cameras and on-screen graphics, the Large Live Event Solution is perfect for supporting both big and small productions. 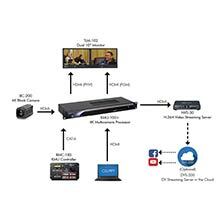 Output options are robust -- great for streaming, recording, and sending video out to additional destinations, like screens, projectors, backup recorders, and more. Easily switch between your PowerPoint presentation and your 4K camera input without ever needing a video switcher. 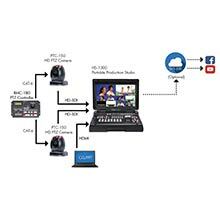 This 3 camera solution focuses on portability and robust aux-out options. 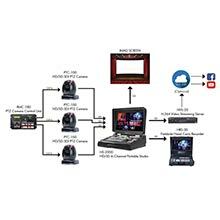 It has a small footprint, and it can record, stream, and send the output to many destinations, like multiple IMAG screens. 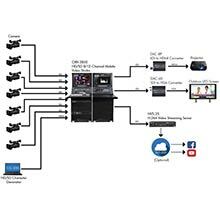 The Outside Broadcasting Vehicle Solution is a fully-fledged production system that can be retrofitted into a van or truck.